RFTT 1967? 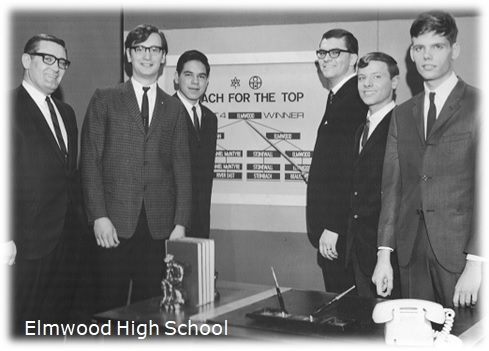 Reach for the Top was my only time to appear on a television game show, way back in Elmwood High School. I was rummaging around some old photographs last week and came across this RFTT 1967 memorabilia. Remember Reach for the Top, the high school game show on television for many years? Long before a couple of Canadians invented Trivial Pursuit in 1981, Canada’s most famous trivia activity was Reach for the Top. A fast-paced quiz show that challenged teams of students from competing high schools to answer trivia questions quickly against the clock. Above, you can see a photo of my team having just won our regional competition, along with the CBC Hosts. Well known personality Bill Guest (left) was not only the quiz master in Manitoba, but also for the national competition from 1969-1985. (Some of you might remember the other well known quiz master, a young guy named Alex Trebek.) CBC personality Lionel Moore (third from right) was the program host. Four students took part on each Reach for the Top team. Robert Bolf (second from left) was a good friend and my neighbor in west Elmwood. We did lots of stuff together. Next is my smiling face third from the left. Classmate Robert Herzog (second from right) and Phillip Hansen (right) made out the team. Phil and I remained in touch for many years. He’s the guy who taught me how to talk fast. Not shown is our faculty adviser, Reuben Romalis, our grade 12 English teacher. So what happened to my team since RFTT 1967? I have lost track of Robert Herzog, but interestingly, the other three of us went on to be teachers. Robert Bolf had a lengthy consulting and information services career. Since 2006 he has been on the faculty at the Humber School of Business in Toronto. Phil Hansen is Professor Emeritus at University of Regina. His academic interests include social and political philosophy, and he has authored a few books, of course. The show’s format included many open questions and teamwork was needed. Everyone remembers the “quick snappers”, too. This video provides a sample of Reach for the Top from my era, and includes Bill Guest. Some people believe Reach for the Top was modeled on the American show G.E. College Bowl. But I side with the argument that it was a spin-off from the BBC program Top of the Form. In the United Kingdom, Top of the Form started on radio in 1949, then ran on television between 1962-1986. In the United States, G.E. College Bowl began its run on radio in 1953, then on major TV networks during 1959-1970. Here in Canada, Reach for the Top was just on television, running from 1961-1985. RFTT 1967 was lots of fun, sort of an athletic competition for us nerds of the era. Oh, you might want to watch the great Monty Python spoof of Top of the Form.